Camping is a popular activity for families looking for ways to bond and have fun. Whether you are planning to visit a local camping ground or are going further away, you need to have everything in place. To avoid getting overwhelmed, you may need to start preparing for the trip months in advance and rope your family in, every step of the way. As soon as you have agreed on the date for your trip, go ahead and book your preferred campsite. Finding an ideal site may need some research thus making it essential to make a booking as soon as you locate one. Make sure that you share correct details including the date, duration of stay and number of people in your family. Also, in case you will have your kids on board, it is advisable to look for kid-friendly spots that have a ton of activities for children of varied ages. It is important to have good tents and appropriate equipment for your camping trip. Some of the best tents for camping are featured on ramblenerds, making it easier for you to select and buy high-quality ones. Test the tents out before leaving for the camping site and ensure they are in good condition. If you are going with your children, involve them in testing other types of gear such as sleeping bags and equipment. 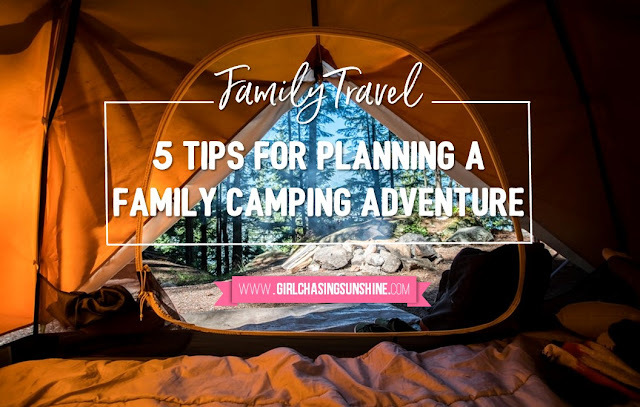 The best way to pack for your family when going for a camping adventure is to start by writing down a list of all the clothes, supplies and other implements needed. The items on the list can be categorized and shared among the family members to ensure nothing is left behind. Confirm that everything is packed in advance and items to be used while on the road are placed in bags that are easily accessible. Before leaving your home, countercheck everything has been wrapped and secured for the trip. Picking out snacks for the road trip to the camping site is usually easy because of the minimum preparation involved. However, planning a menu for the entire duration of the camp can be overwhelming, requiring that you plan early. Stick to meals that are easy to prepare and cook regardless of the time. Also, buy food items that can be roasted over a campfire when you want to enjoy time under the stars. Having a list of things to do makes camping much more structured and fun for most families. The activities can be picked by the parents and kids to ensure that everyone has fun. Also, inquire about the activities available at the campsite and choose the ones that will be enjoyable for your family. Some of the exciting activities to do when camping include fishing, flying kites, scavenger hunts, among others. Generally, camping is an excellent way to get away from the hustle of city life, connect with nature and spend quality time with your family. Have you tried camping with your family? Share your experience below!